I conclude my three look at 2013’s most memorable par-3s with three more holes that made indelible first impressions. As a group, the par-3s at Aviara are the best I’ve played in San Diego County. They’re a sensational mix of distance, difficulty and beauty. The long uphill par-3 6th is the only one not played over water, and it’s undoubtedly the toughest of the bunch. How often do you say that about a course? The answer I’m probably supposed to give in this space is No. 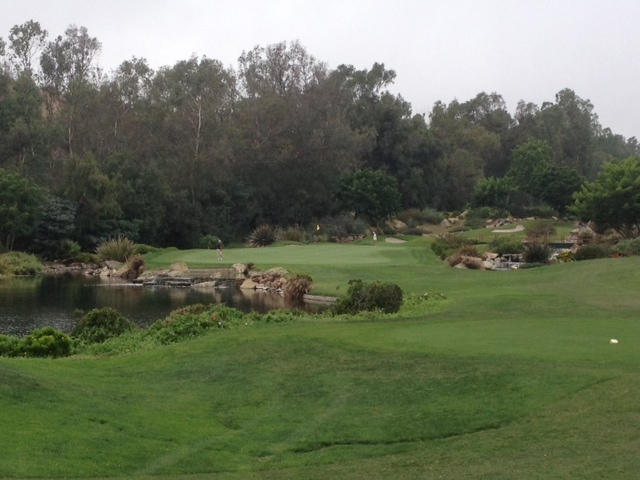 11, since it’s the signature hole and certainly botanically beautiful, as almost all of Aviara is. But I’m going with No. 3, which is plenty gorgeous in its own right, because it was the more memorable hole from personal experience and from attending the LPGA’s Kia Classic. As you can see from the photo, No. 3 is a short par-3 played to a green, by far one of the smaller ones on the course, with water looming left and right. It can also be water short and right depending on where they put the tee box. This holes has multiple tees that vary how the hole is played tremendously, which is one of the things I really love about it. I remember walking up on this hole at the Kia and just marveling at it. It’s a short par-3 that is beautifully framed and accented, but this beauty is tougher than it looks. At the Kia, I watched this hole be feast or feminine for the pros. It’s a terrific tournament hole to watch because you get such a great range of golf. Personally, I found the water right (Splish!) and then right (Splash!) again the first two times I played it. The third time, my ball finally found the green on the right side, leaving me a devilish downhiller that I nearly sank for birdie. Amongst my golf friends who play here, No. 3 is one those holes that becomes like soap in the shower: Birdie slips away time after time on this hole even when you think you’ve got it down and know every putt by heart. Another cool thing about this hole, and the course itself, is that you can really appreciate the change of seasons here. It’s beautiful year round, but, as you can see at top, spectacular when the course is blooming. You may not par all the par-3s at Aviara, but changes are you won’t have to think too hard to remember them. I might nickname this hole “The Speed Bump” because it kept from me shooting what should’ve been a pretty nice number on the back nine at Barona twice. It’s not a long hole – just a shade under 140 yards – but I can’t seem to club it right, and, as you can see, save for leaving it way out left, there’s no good miss here. The myriad of deep bunkers short and long, not to mention the deep native grasses, have the pin here protected like Fort Knox. 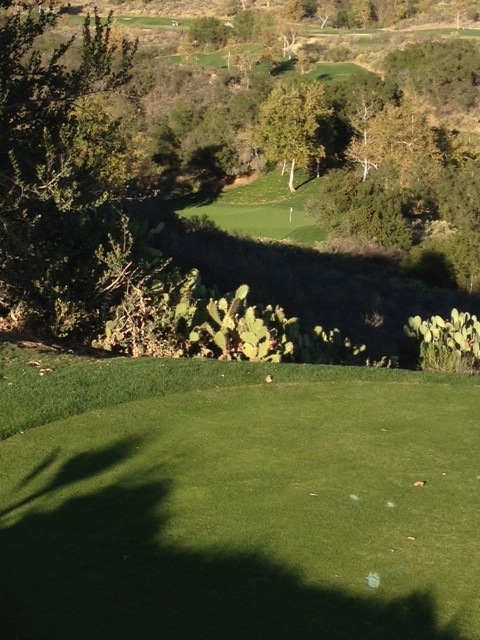 This hole and the one I posted from Wilshire CC have a lot in common, but this one’s tougher. If I can solve No. 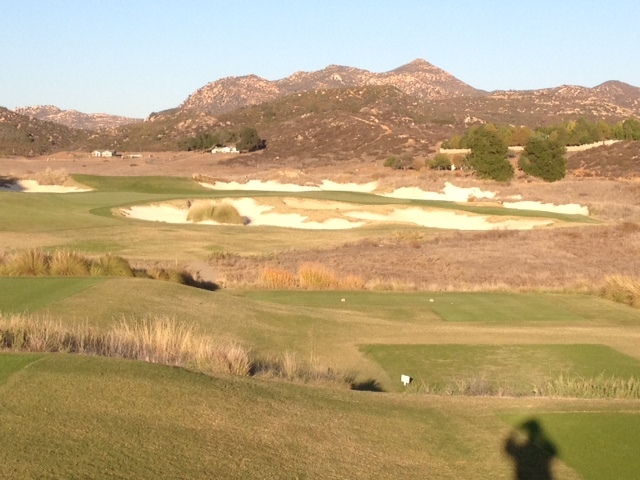 16, I’m confident I can break 40 on the back at Barona as long as the green speeds are reasonable. I look forward to giving it a go on what certainly was one of my favorite courses this year. I have yet to find a golfer who’s played here who doesn’t speak longingly about going back. There is a seductive quality about the course and a challenge that, intentionally, always seems just a round away from being met. I plan to meet it in 2014. 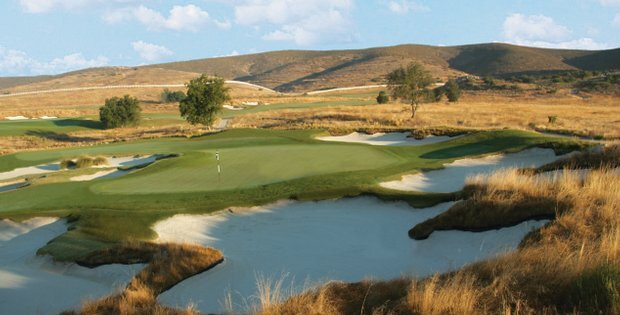 California is blessed with an abundance of elevated par-3s, so much so that people seem to take them a bit for granted, like par-3s are just born that way. Being from the Midwest, I can tell you they aren’t. 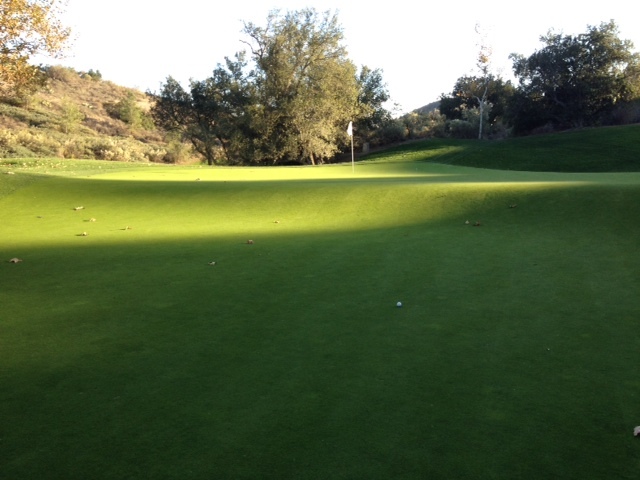 That said, I can’t imagine anyone taking 17 at Dove Canyon for granted. When you come to the tee on 17, especially the back tees, you can’t help but do a double-take and then just laugh. It looks like you’ve discovered the Grand Canyon of golf. It’s a golf hole that seems a bit preposterous, yet totally great. You’re so high up that the flagstick stick looks small, like you might be mistaking it for a landscaping stake or something. It seriously feels like you’re hitting it off a 10-story building. And no matter where you tee it up, I deem it to be about a two-club drop. From the blue tees, I hit an easy 8-iron that nearly flew the green. I surely could’ve gotten home jumping on a pitching wedge. But the tee shot is only half the story here. The green has dramatic drop-offs on the front and back. My ball landed beyond that back tier. Figuring I’d have to muscle it up the five-foot rise to get it to the hole, I watched my putt clear the ridge and shoot right past the hole. A two-putt comebacker left me with a bogey. This is really the kind of hole where you’d love to take a shag bag to the tee and just drop wedges and short irons to see if you could get lucky. It certainly rated as one of the most fun holes of the year. I also recall that as I walked off the green, I spied a speck of white in the bushes. I plucked out a lost ball stamped “The Olympic Club” – you know, that little place where they played the U.S. Open two years ago? One of my rules is that you can tell the quality of the course you’re playing by the lost balls you find. And this is the course were I saw the 20 deer. Yes, Mr. Nicklaus has created quite an experience here. And hats off to you on No. 17. This entry was tagged Aviara Golf Club, Barona Creek, Carlsbad, Dove Canyon Country Club, Jack Nicklaus, par 3s. Bookmark the permalink. Great article Corey, the par 3’s look amazing! You have my dream job…lol!